Welcome to the first Seminar on Pune school admission for the next admission season. Click the link below to book your ticket now as there are limited seat only to avail a Rs 500/- concession too. 1. The Questions & Answer session will be based on the first come first basis the “Find The Best School” form is received.A Google form link will be mailed to you, after you buy the registration ticket. This form is to help the Expert “Find The Best School” for you. 2. Hence those who send their forms first, get to ask their questions first. 3. You must Like the Facebook Page. Click this link and Like the page. 4. You must Subscribe to the New articles and reviews on www.madhuriesingh.com by clicking here. 1. If you test a new website and give your thorough feedback, the fee is Rs 1499/- only ( a concession of Rs 500/-) for a 2 hour session. If you agree to test the site, kindly fill this form. You will receive a test form that you must fill in completely after testing the site, to receive your concession* after the Seminar is over. 2. For all others the fee for the seminar is Rs 1999/- only for a 2 hour session. 3. If you need to have one on one face time with the Expert, Kindly book the workshop @ Rs 3999/- for one hour session by replying to this email. 4. You may also have a phone consultation with the Expert, by booking the call @ Rs 1999/- for one hour call by replying to this email. Check out the Pune School Reviews Facebook Page & LIKE it. Click Here. Do not miss any review or article! Click to get your free copy. Wait! Do not fill DPS Pune admission form yet! 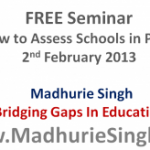 Over Booked – Now on Sunday, 3rd Feb 2013 ALSO FREE Seminar – How to Assess schools?